Overloading with its associated impact on the deteriorating road conditions pose potential risks to vehicle and public safety says Parveen Bala. The Minister for Local Government, Housing, Environment, Infrastructure and Transport highlighted this when announcing the successful procurement of four additional sets of portable wheel weighers. 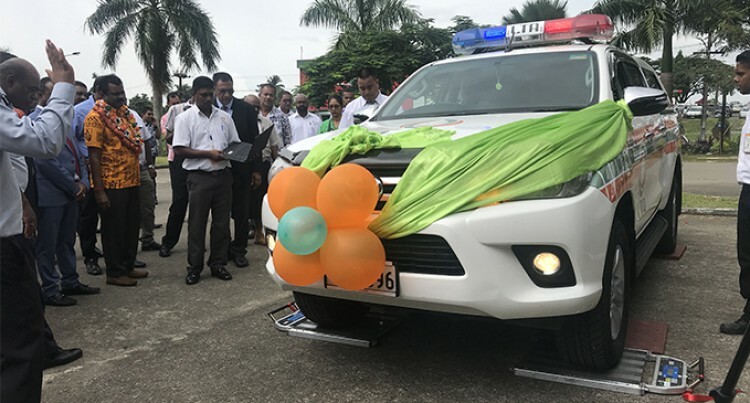 This was during the launch of the Land Transport Authority projects of the year 2018 at LTA headquarters in Valelevu, Nasinu on Friday. The four sets of wheel weighers were purchased for the combined price of $297,000. They can be utilised by four different groups carrying out overloading enforcement operations. To curb the issue Mr Bala said the LTA enforcement unit had been working around the clock with a couple of permanent weighbridges at the LTA’s disposal and with the additional help of portable wheel weighs. He said while there were already works underway to install more permanent weighbridges around the country to increase overloading enforcement. In the meantime, the teams have utilised whatever resources were available to its maximum utilisation. “The training has been provided to all overloading enforcement unit officers and selected engineering staff,” Mr Bala said. “The project has given the necessary boost to the hard working overloading enforcement unit. “Because together with equipping the team with newer and technologically enhanced state of the art weighing gear the project has also provided a chance for staff to upskill and improve their knowledge through training. He said we have to acknowledge the importance of mobility, but some situations demand mobility with an option of durability. “The LTA enforcement operations is carried out on such an extensive scale that some areas do not become an option for night operations,” the minister said. “Our LTA engineering and enforcement teams initiated a combined project for the design and construction of a caravan. “The caravan has been successfully built and registered and came with packed proper travelling and living facilities,” Mr Bala said. LTA board chairman Vijay Maharaj said the caravan could cater for four people and is facilitated with kitchen, beds and other necessary utilities. “The caravans will be utilised in the remote areas so the caravan will give them space to stay overnight while carrying out their duties,” Mr Maharaj said.